(12:50 p.m.) -- More than a day after Category Five Hurricane Dean smashed into the Yucatan Peninsula, the eye making landfall near Costa Maya, news is beginning to surface about the fate of one of Mexico's most popular cruise stops. Preliminary estimates indicate that the dock will be out of commission for the next six to eight months; approximately 50 percent of the pier is gone. Vessels scheduled to head to Costa Maya and Belize, just over the border, had already been re-routed days ago, but it remains to be seen when they will be returning. The official statement from Costa Maya is that they hope to see cruise ships return by the middle of 2008. Roatan and Belize City are the most likely candidates to replace Costa Maya on Western Caribbean itineraries. The story is reminiscent of what happened in October of 2005 when Cancun's cruise dock was decimated by Hurricane Wilma. At that point, cruise lines began diverting their ships to Costa Maya, which began to take off as a port. Almost two years later, cruise liners are still required to tender in Cancun, and the pier rebuilding project won't be completed until fall of 2008. 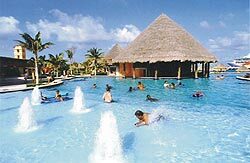 Meanwhile, the Riviera Maya, which includes Cozumel, Play del Carmen and Cancun has survived intact. Tourist infrastructure is reported to be undamaged, and most services are returning to normal business operations. This is likewise the case for Belize, which was also spared the brunt of the storm. At this point, Hurricane Dean is a Category One storm with sustained winds of 90 m.p.h. It's expected to make landfall later today over the Gulf Coast of Mexico. Here are the latest damage reports. Stay tuned as new information becomes available. At about 4:30 a.m. on Tuesday morning, the eye of the storm made landfall near Majahual, one of the towns in the Costa Maya region, with maximum sustained winds of 165 m.p.h. and gusts of up to 200 m.p.h. The cruise pier is located only a few miles from Majahual, and the latest reports are that at least half of the dock -- custom built for cruising in 2001 -- has been destroyed. It's being reported that rebuilding will take at least six months. Waist-deep sea water is said to be covering most of the town, which also suffered significant damage to its buildings. No problems, however, has been reported of Mayan archaeological sites in the state of Quintana Roo -- one of the areas' big draws. Posters on the Cruise Critic boards are submitting their favorite pictures from Costa Maya and hoping that photos aren't all they have left. Cozumel, well north of Dean's landfall, saw strong winds as a result of the storm, but tourist infrastructure, including bus stations and highways are fully functioning, and popular attractions such as Xcaret and Xel-ha will reopen for business tomorrow or Thursday. Royal Caribbean's Rhapsody of the Seas is still scheduled to call in Cozumel this Friday, and several Carnival ships, including Carnival Conquest, Carnival Fantasy and Carnival Ecstasy will visit Cozumel as scheduled. There's been heavy rain, local flooding and some large waves, but no damage is being reported to the popular cruise stop of Belize City. Hotels and business are fully functional. Carnival Cruise Lines had already diverted Carnival Legend and Carnival Valor away Belize, and both ships will sail more easterly itineraries. See our Itinerary Change Roundup. Flooding and landslides are feared as a result of Dean's impact. Carnival Valor, originally scheduled to visit Roatan on Wednesday, will instead stop in St. Thomas. According to the Jamaica tourist board's latest report, recovery crews are still surveying the overall damage to the island. Like several other Caribbean islands, preliminary reports indicate that Jamaica has avoided the potentially devastating consequences resulting from a direct hit by Hurricane Dean, with the eye skirting, rather than hovering over, the southern end of the island. Jamaica's two largest cruise ports, Montego and Ocho Rios, are located on the north coast of the island, and as a result, tourist infrastructure (resorts, airports) has remained largely undamaged. The majority of the issues appear to be in the form of flooding, downed trees and utility poles, and a "substantial amount of damage to roads." Most cruise lines have already re-routed their cruises from Eastern to Western Caribbean itineraries through the following week; one notable exception, however, is Royal Caribbean’s Freedom of the Seas. That ship departed yesterday from Miami for a seven-night Western Caribbean trip and will call on Wednesday at Montego Bay. Folks at popular tourist attractions like Ocho Rios' Dolphin Cove and Red Stripe (catamaran trip to Dunn's River) told Cruise Critic that they will reopen for business this Wednesday. Montego Bay's Pier One on the waterfront will be fully operational by tomorrow. Check our list of updated itineraries for more information. Dean ended up passing 100 miles south of the Cayman Islands, sparing the island of severe damage though Grand Cayman, a major cruise destination, did get quite a bit of rain and wind. Tourist infrastructure is operating normally, and both Freedom of the Seas and Rhapsody of the Seas will visit Grand Cayman on Thursday as scheduled. Hurricane Dean passed north of the island, resulting in heavy rains, power outages and downed trees. By Saturday, electricity was restored, and the main tourism infrastructure was back in place. Popular attractions such as International Riding Stables and the St. Lucia Golf & Country Club are open for business, but guests should not expect beaches or golf courses. Horseback riders should expect a fair amount of debris on the beach, and golfers are restricted to play on the back nine. The sand in bunkers has also been washed away. No date has been set for the course to be fully functioning. Barbados was generally spared from the hurricane, with only rain and some flooding to report and no major damages to the island. Tourist attractions, such as the Mount Gay Rum Tour and Andromeda Botanic Gardens, are open for business as usual. A least two people were reported dead as a result of Hurricane Dean. We'll provide more detailed information as soon as it's received. Widespread flooding (and destruction of all of Martinique's banana crop) were reported, as were the deaths of two people, according to the Associated Press. Official word from Martinique's tourist bureau is forthcoming. Though the shared-island nation (Dominican Republic occupies part of Hispaniola; Haiti's the other nation) was spared the worst of Dean, the hurricane created huge waves of up to 20 feet high on the southern coast, resulting in flooding roads. One boy drowned. Tourist infrastructure is expected to be back in place as normal at port magnets such as La Samana and Casa de Campo, but as today is a national holiday (Restoration Day), businesses are closed anyway.